Header: Gets/sets the root element of the breadcrumb control. CurrentItem: A property of type object, which gets the current destination data item. CurrentContainer: A property of type RadBreadcrumbBarItem, which gets the RadBreadcrumbItem container of the current destination data item. Path: Gets/sets the destination target path. PathSeparator: Gets/sets the path separator symbol. IsLinearMode: A property of type bool, which controls whether the breadcrumb is in linear mode. By default this property is False . IsIconVisible: A property of type bool, which controls whether the icon of the breadcrumb control should be displayed. By default this property is False . IsTextModeEnabled: A property of type bool, which controls whether the text mode of the breadcrumb is enabled. By default this property is True . IsHistoryEnabled: A property of type bool, which specifies whether history of visited paths should be kept. By default this property is True . Even if the IsHistoryEnabled property is set to False, you can add items to the RadBreadcrumb.HistoryItems collection. You can use this collection to create a set of favorites for example. Header: Gets/sets the header of the BreadcrumbItem. 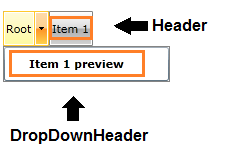 DropDownHeader: Gets/sets the header of the RadBreadcrumbItem that is used to visualize the item when displayed inside its parent's dropdown content. Image: A property of type ImageSource, which allows setting an icon for the item. Please avoid using the character set as a PathSeparator in the Header of the items, because this can lead to an unexpected behavior when you try to expand a path. Also, keep in mind that the '\' character is the default PathSeparator.